Video Cutting to the Extreme. Higher Speed and Smarter Performance. 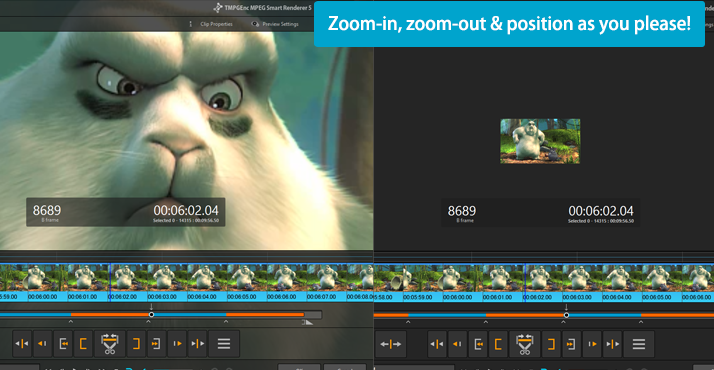 The Video Cutting Tool That Lets You Dig Deep Into Editing. Now Supports H.265/HEVC Smart Rendering. TMPGEnc MPEG Smart Renderer 5 is a high-speed video cutting tool focusing on MPEG video file formats. The product is designed so that you can cut videos with great speed and detail, and also incorporates the "Smart Rendering" function which allows super-fast output with practically no loss in quality. In addition to MPEG-1/2 and H.264/AVC, this version newly supports H.265/HEVC - a new format for the 4K and 8K generation. With an aim on increased Smart Rendering support, this tool takes a "back to basics" approach, focusing on faster and smoother video editing. It not only reconsiders the internal processing but also pursues to optimize elements other than programming such as the seeking procedure, the cutting order and other functions. One new feature, the Production Tool, is developed for your advanced preparation for editing, which allows you to perform the Commercial Candidate Detector and Indexing for Seeking functions automatically. Also including a Blu-ray BDAV authoring function, this new product can grant amazingly high-speed, high quality cut-editing and outputting. This version is designed only for 64-bit architecture environments. Along with this enhancement, the application is capable of using an outstandingly large memory size. Therefore, editing operations that contain ultra HD editing, complex filtering, file importation, video rendering, clip copying, etc. become much easier and lighter to handle. TMPGEnc MPEG Smart Renderer 5 features the "Smart Rendering" output function. Smart rendering has the ability to analyze a video file and re-encode only the parts that have been changed, such as cut/split/join points and sections where transitions or other effects have been added. Parts of the video that have not changed are not re-encoded. TMPGEnc MPEG Smart Renderer 5 supports the smart-rendering of the MPEG-2 Video format which is used for DVD-Video, the H.264/AVC format which is for websites such as YouTube, devices such as smartphones, AVCHD camcorders, and the "H.265/HEVC" format which is newly supported and the successor to H.264/AVC and is the latest video compression standard. TMPGEnc MPEG Smart Renderer 5 is great for editing AVCHD or XAVC camcorder recoding videos, Blu-ray disc videos, web videos, and more. * Some supported format files may not be smart-rendered depending on the video parameters, etc. TMPGEnc MPEG Smart Renderer 5 does not have the functions for compressing whole video files, nor for changing the resolution. If you want those functions, please consider our multi video encoder, "TMPGEnc Video Mastering Works 6". 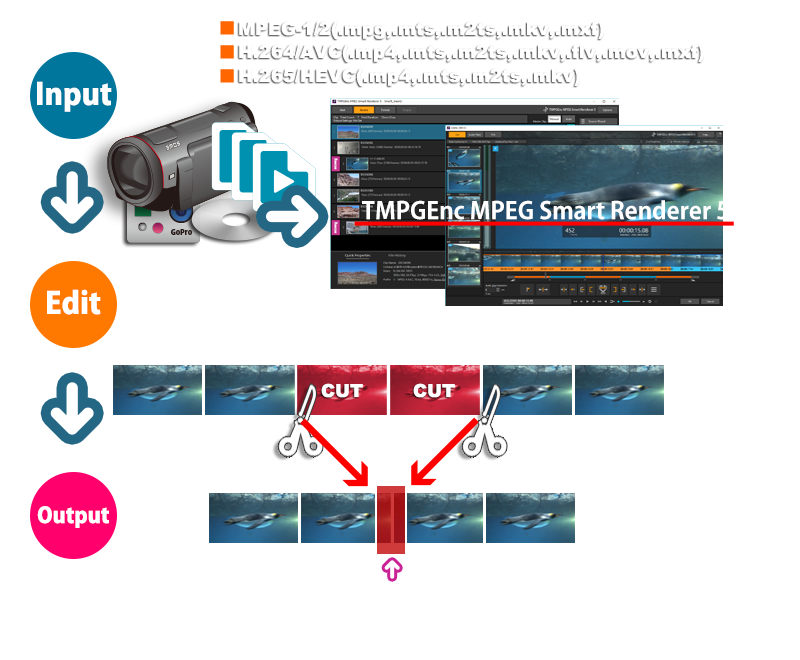 TMPGEnc MPEG Smart Renderer 5's smart rendering function supports not only cut ranges but also where files are connected. This allows you to join multiple files which are recorded by a digital camcorder or smartphone into one file. Simply put, no smart rendering problems will occur when importing files which were recorded by the same device since the video parameters are the same. However, importing multiple clips that have different parameters (such as resolution) from each other requires adopting the different parameters which cannot be smart rendered. In such cases, TMPGEnc MPEG Smart Renderer 5 can analyze and reflect the files which have different parameters as a "Rescue Clip", and can join and output in high quality using the integrated high-definition encoder. * Only supported MPEG formats can be input into TMPGEnc MPEG Smart Renderer 5 as a Rescue Clip. At least one video file must be smart renderable per project. For smart rendering output, the quality of the encoding engine is held as one of most important elements. If the quality is low, then the low quality encoded parts will stand out on video playback, thus reducing the whole quality of the video. That is why TMPGEnc MPEG Smart Renderer 5 integrates the best encoders which results in the best quality output video. Incorporates the "x265" which is constantly evolving as an open source product. Its quality and encoding speed are also commended worldwide. AAC audio is used in a number of video formats such as MPEG-2 TS and MP4. Incorporates the high-quality AAC audio encoding engine by Fraunhofer IIS for all AAC encoding during output, which is known particularly for sound quality. There is no compromise for the audio quality as well as the video quality. MXF container is now supported. TMPGEnc MPEG Smart Renderer 5 supports popular containers which contain the supporting video formats (MPEG-1/2, H.264/AVC and H.265/HEVC) for input and output. This version further supports importing MXF containers, which widens the possibities of editing even further. * Selectable container is restricted depending on the imported video format and container type. * Some files cannot be imported depending on the container construction. Output Conforming to the Standards Such as Blu-ray and AVCHD. If an imported file has the video format and parameters meeting the standards or the regulations, TMPGEnc MPEG Smart Renderer 5 can output the file conforming to the Blu-ray (BDMV/BDAV) or AVCHD standards. Use the output files as materials in separate authoring software such as our TMPGEnc Authoring Works series. As a plus, you can verify possible output targets based on the clip's parameters in the Target Indicator function in the Clip Properties. Supports importing and outputting using the high quality video 4K/HD video format "XAVC S" which is advocated by Sony and capable of storing high resolution and high bitrate videos compared to the AVCHD standard. The output file can be played on XAVC S playback supported devices. * Requires an imported video format which conforms to the XAVC S standard. * Some devices may not play the output file which was created by external software. Please refer to your device's user manual or contact the device maker before use. * There is no authoring function other than Blu-ray (BDAV) in TMPGEnc MPEG Smart Renderer 5. Blu-ray (BDMV) or AVCHD authoring requires separate authoring software such as our TMPGEnc Authoring Works series of products. TMPGEnc MPEG Smart Renderer 5 is capable of authoring the edited video files to the Blu-ray in BDAV format*1, and allows you to burn it to disk. Furthermore, it features an append function that appends the output to an already recorded BD-R or BD-RE media. Not only great for watching your video, it can also help to reduce your hard disk used space, or you can use it for material archives and other uses. 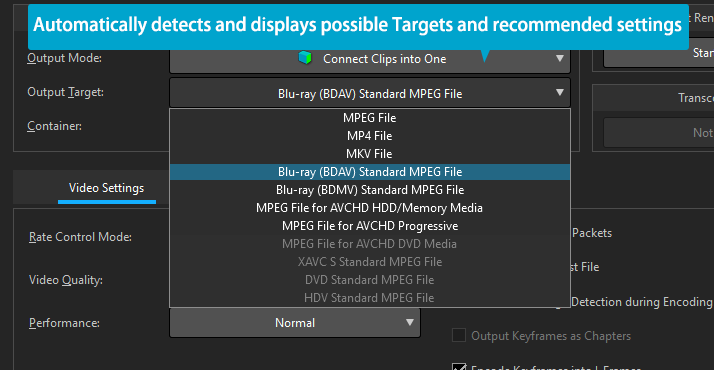 * When using the Blu-ray authoring function, the imported file is required to conformed to the Blu-ray (BDAV) standard. *1 The "BDAV" Blu-ray standard does not support menus. If you want to create a Blu-ray with menus (BDMV) standard, please consider to use our TMPGEnc Authoring Works series of products. We've Polished the Editing Function and the Interface. Implement the Shortest Editing Workflow. TMPGEnc MPEG Smart Renderer 5 reduces complicated processes and procedures, and provides an incredible interface which is capable of cutting, editing and reaching the output in the quickest time by adhering to the simple workflow of Import, Edit, Settings and Output. Clip Input Becomes More Convenient and Comfortable. Title/Multi Stream Analyzer - Post-application supported. This function analyzes a file at importation and allows you to select a specific import title clip within a Blu-ray, AVCHD file, etc. 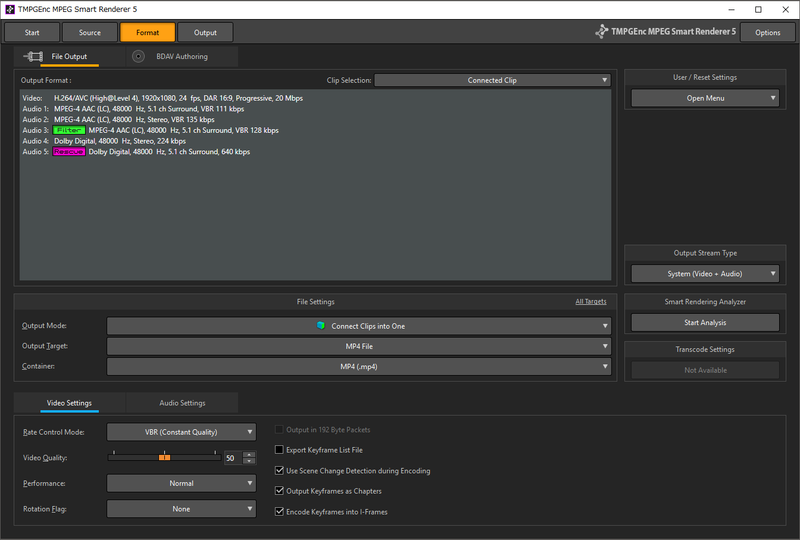 Regarding a MPEG-2 TS or MXF file, the function analyzes and lets you choose a multi-structured video file (containing several video and audio streams) or video where the resolution changes mid-flow. 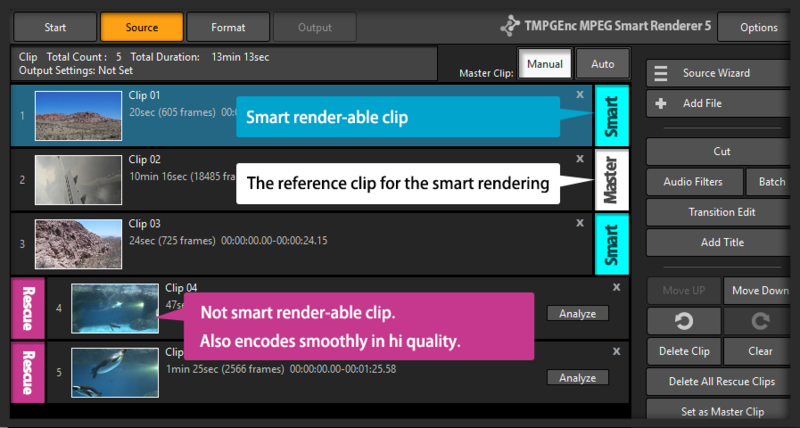 TMPGEnc MPEG Smart Renderer 5 allows you to use the analyzer for a file even if you did not choose to analyze it when importing. 10-bit 4:4:4 H.264/AVC Input and Output Support. TMPGEnc MPEG Smart Renderer 5 is capable of importing the H.264/AVC High Intra 4:4:4 profile and output using smart-rendering. This allows you to output in high quality and not be affected by the limitations of the profile. 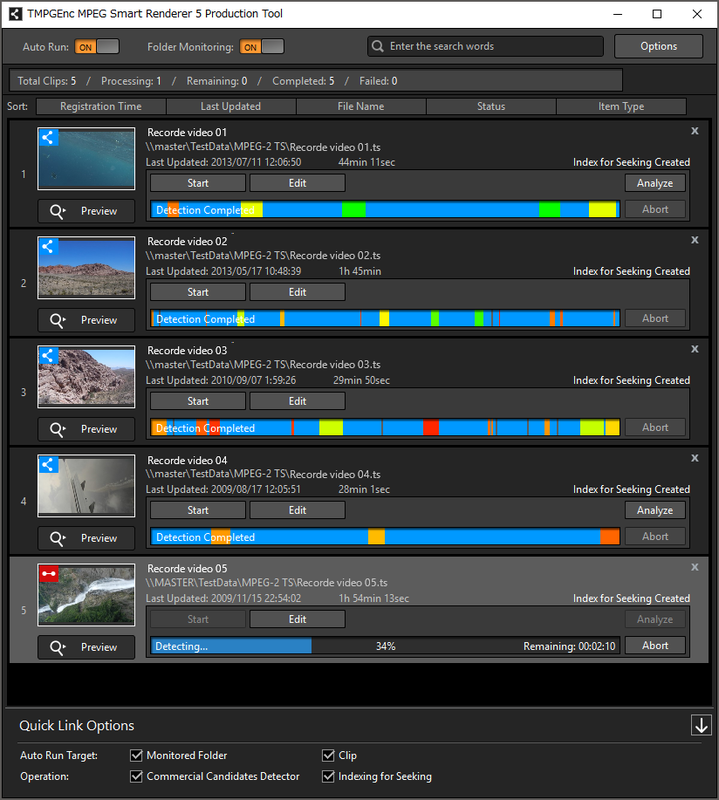 TMPGEnc MPEG Smart Renderer 5 allows you to share clips by dragging and dropping between applications. In case of progressing several projects all at once or other cases, which makes your work be speedily rather than that of old versions. When simply cutting a video, not displaying and cutting the correct position would turn your hard work into a waste of time. The Cut Edit window, which is the core of TMPGEnc MPEG Smart Renderer 5, brings you presice results because of our developed skills and experience. 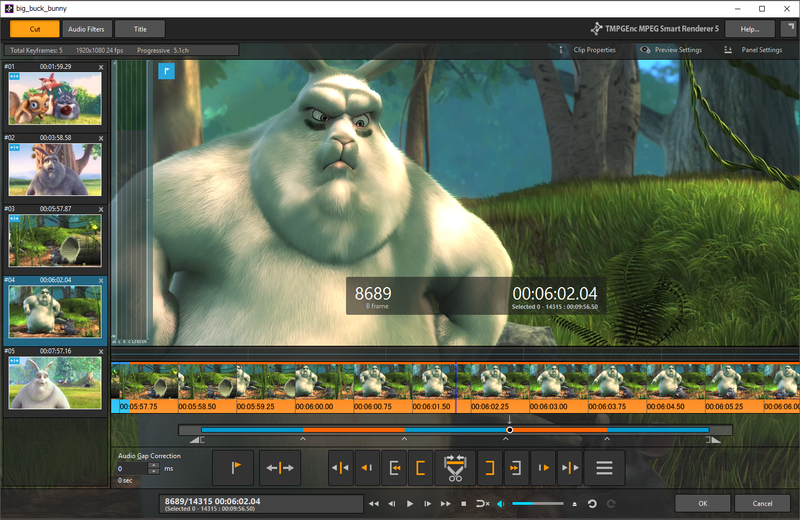 We've reworked the internal processing of the editing window and it has been enhanced with functions to support 4K and 8K high-definition editing. A single frame is the smallest unit of a video. TMPGEnc MPEG Smart Renderer 5 can edit at the frame level, so the frames you cut are the exact frames that will be removed upon output. Other products cut at the GOP (Group of Pictures) level, so cuts in those products can actually remove more frames than you want. Frame level editing also helps minimize re-encoding during smart rendering output. Even Faster with Index for Seeking. Drag seeking is one of most frequently used functions in cut editing. In this version, the drag seeking implements even faster seeking with an improved algorithm. Also, by using it together with "indexing for seeking," which creates position point data of an imported clip, it allows you to seek easier and faster compared to older versions. * The indexing for seeking can be set to automatic or manual. Adding to the Batch Cut function which allows you to cut many scenes at once by specifying arbitrary split points, TMPGEnc MPEG Smart Renderer 5 further allows you to register an arbitrary split range as a clip in real time. 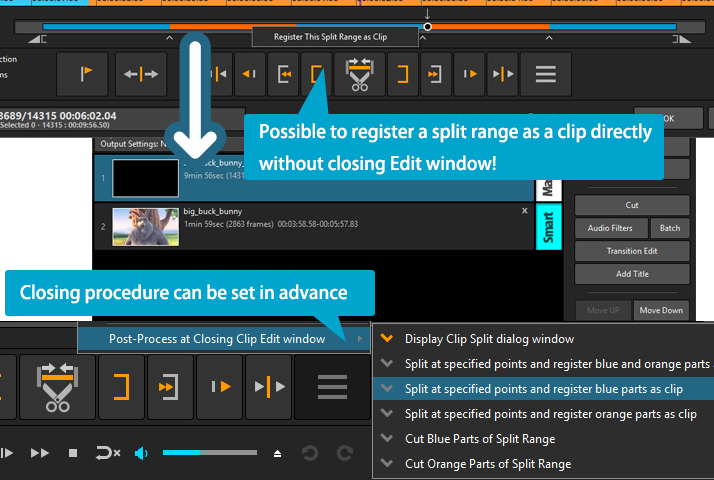 You can also specify the clip splitting method in advance in this version, which can reduce the editing time even more. When you cut in the previous versions of the TMPGEnc MPEG Smart Renderer series, you had to set the Start and End points and then press the Cut button. We figured that if you already determined the End (or Start) point, the action of pressing the Cut button is superfluous. 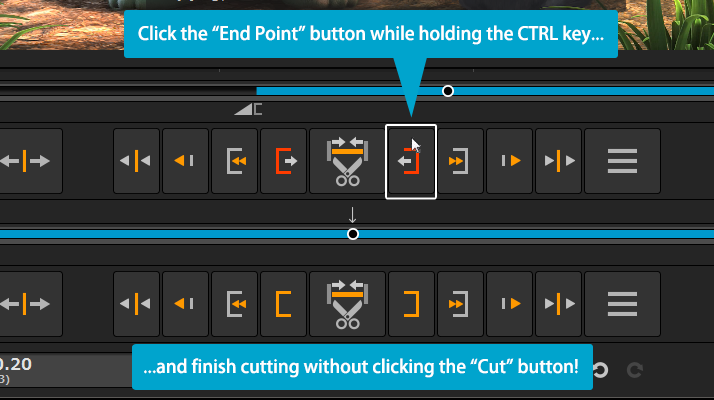 So in this version, we created a "Quick Cut" function that can cut the specified range immediately by being holding the [CTRL] key when clicking the End (or Start) point button. The Preview panel of TMPGEnc MPEG Smart Renderer 5 allows you to zoom-in, zoom-out and even drag and reposition the preview image to your liking. This allows you to examine fine details in your video in real-time while playing. 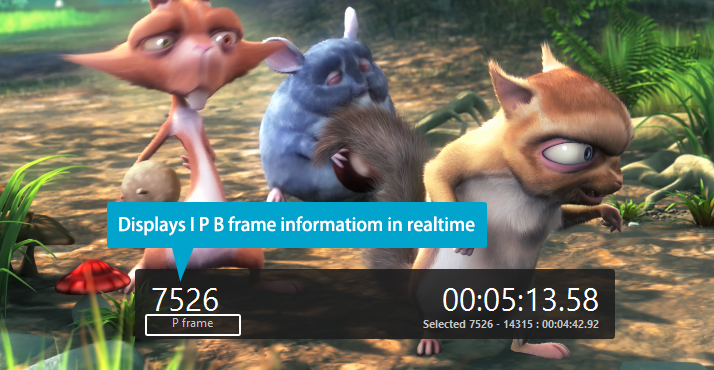 TMPGEnc MPEG Smart Renderer 5 can display the current frame number and time in the preview area. The current frame picture type information (I / P / B frame) is also displayed, which is useful to verify and reduce the re-encoded ranges. * Cannot be displayed in the Title Edit window. TMPGEnc MPEG Smart Renderer 5 supports undocking the player control panel, which allows you to place the panel anywhere you want. You can control the position and setting depending on your editing situation. Setting the cut points repeatedly for video sources which have the same unwanted ranges such as commercials is a waste of your time. To resolve this, TMPGEnc MPEG Smart Renderer 5 allows you to register the current keyframe list as a preset, allowing you to reuse the preset for other clips, thus reducing repetitive work. 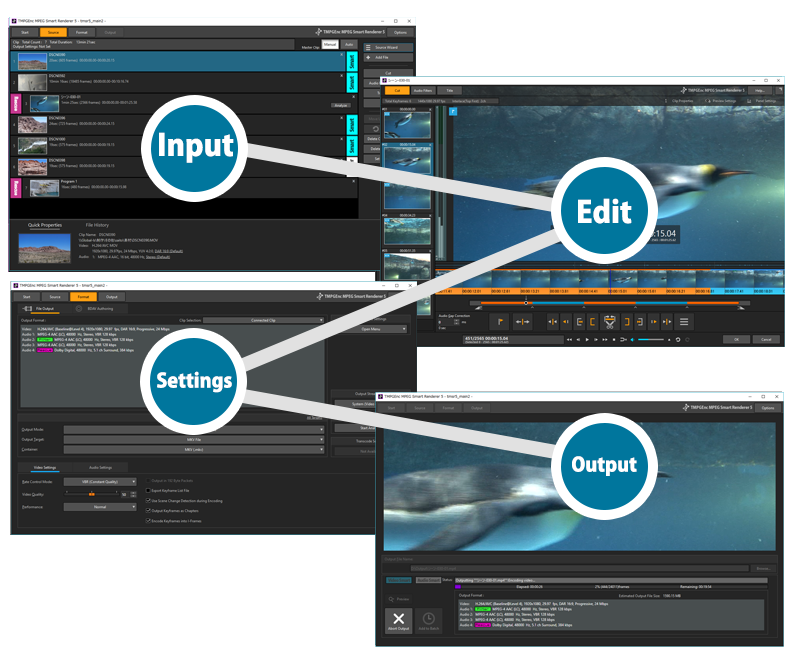 The Intel Media SDK utilizes the power of Intel Quick Sync Video included in the second generation Intel Core™ processors to assist the decoding process. In a compatible environment, TMPGEnc MPEG Smart Renderer 5 supports H.265/HEVC hardware decoding of those functions. With TMPGEnc MPEG Smart Renderer 5 and a supported Advanced Micro Devices' graphics card environment, you can utilize its H.264/AVC hardware decoder functions. 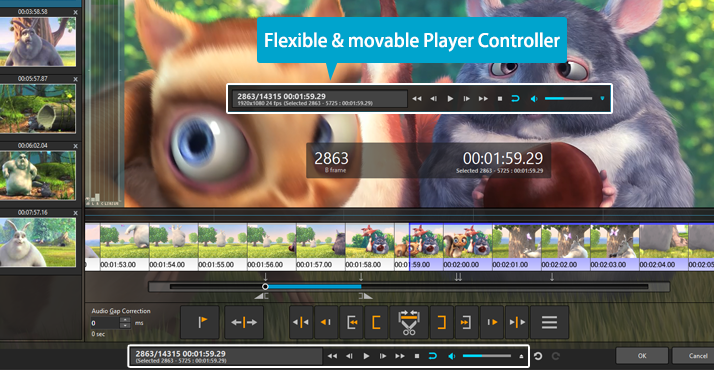 In the supported environment, it allows you to edit with faster and smoother video playback due to its high speed decoding. This "Title" function is capable of adding a description or a title to your video where you can customize the layout and use any font on your computer. In TMPGEnc MPEG Smart Renderer 5, it is possible to add titles to several ranges in a clip. * Cannot be used as subtitles for DVD-Video or Blu-ray. * Portions of the video with text overlays will be re-encoded. Detect Commercials For Easy Editing. TMPGEnc MPEG Smart Renderer 5 supports the "Commercial Candidates Detector" which analyzes several elements in a clip such as audio and scene change positions, and detects the most likely candidate positions of commercials. Utilizing this function together with the Batch Cut function further saves editing time. 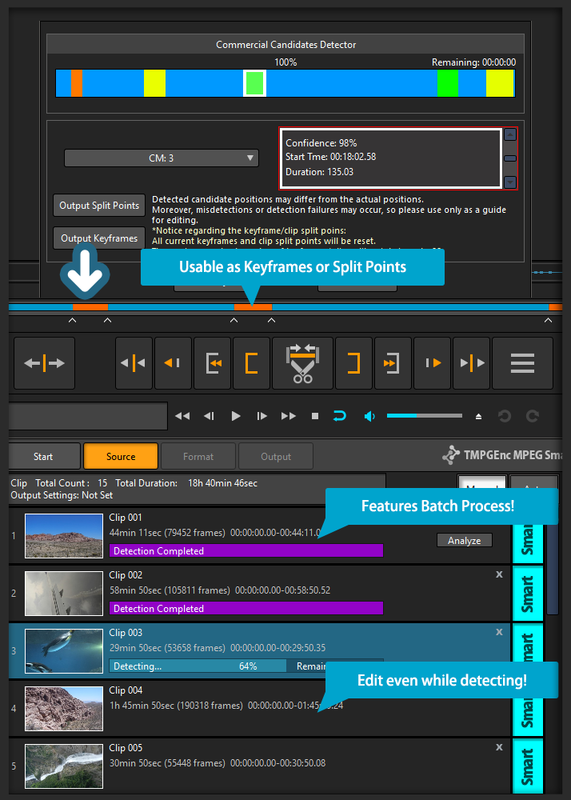 The "Pre-commercial Candidates Detection" function is also incorporated in this application, which can analyze multiple clips in the background without opening the clip editing window. 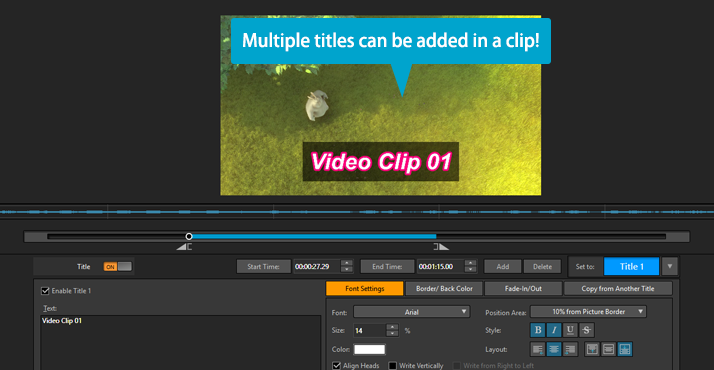 Even if there are clips being analyzed, you can edit another clip normally, so you can use your time efficiently. 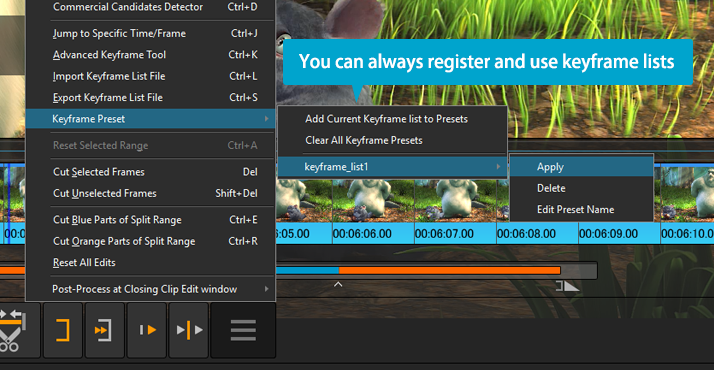 * The "Batch Cut function" allows you to cut color coded sections of clips (either blue or orange) all at once. * While the pre-commercial detection function is running, you cannot edit transitions or move to the output settings screen. Output Settings - No Special Knowledge Needed. We've excluded as much unnecessary information as possible in the output settings and organized it into a simplified layout. 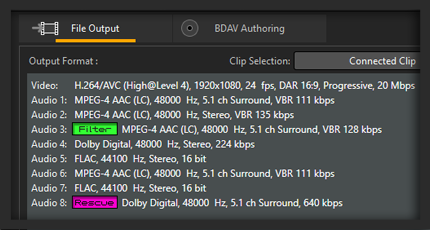 You can see all of the streams in the selected clip including labels for streams that will be re-encoded or have filters applied to them, which makes it easy to see what will happen to each clip upon output. Choose According to Your Purpose. In TMPGEnc MPEG Smart Renderer 5, the selectable output targets (MP4, MKV, AVCHD, etc.) and the related settings for clips are automatically set by detecting the properties of the Master or other clips. The first displayed setting is the most basic recommendation, so you can process the output even if you don't have special video knowledge. If unselectable targets are displayed, the reason why it's unselectable will be displayed so you can verify whether there is a problem in the imported video. Simplified Video and Audio Settings. Since the parameter settings (including most internal detailed settings) for video and audio are automatically optimized and processed by the application's engine, you can use the basic settings without any changes. Of course, if you want, you can adjust various video settings such as aspect ratio, rate control mode, quality (sets bitrate allocation relative to the original source's video data quantity), and performance levels (sets precision and output speed levels against the quality; H.265/HEVC: 9 Steps, H.264/AVC: 7 Steps, H.264/AVC: 4 Steps). 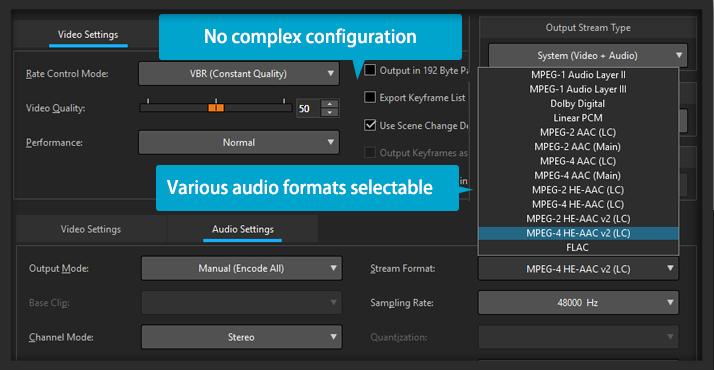 For the audio settings, you can manually set the format, bitrate, channel mode, and more. Input/Output Up To 8 Audio Streams. Supports the importation of multi-stream audio/video files which contain up to eight audio streams. This function can be used for a wide range of creation such as a multi stream MKV file or a file for Blu-ray authoring. 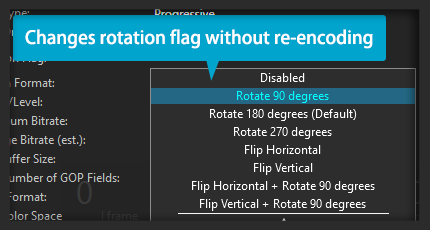 Supports replacing the rotation flag for a MP4 file. Allows you to replace the current rotation setting of a video (such as those recorded by a smartphone or other device) without re-encoding. For example, you can change a vertically-shot video to a horizontal video. * Since changes cannot be made to the actual video streams by the rotation flag, the players supporting such files are limited (QuickTime Player, etc.). * The imported clip formats which allow changing the rotation flag are limited to MP4, MOV and MKV files (containers). Only MP4 files can apply the rotation flag when exporting. Automatically Assists With Advanced Preparation for Editing. 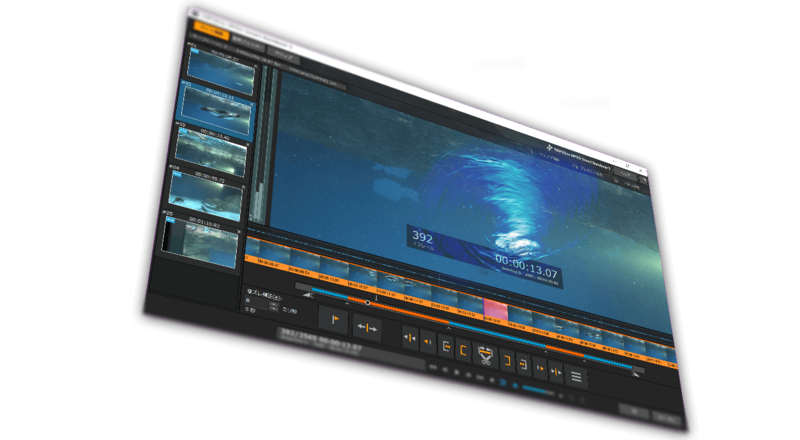 The all-new "Production Tool" automatically assists with the production of your video editing process, reducing your workload. The Production Tool has the monitoring folder function, which always monitors the specified folders and adds clips automatically when detected. These added clips will automatically have the Commercial Candidates Detection and Indexing for Seeking functions applied to them. With those steps out of the way, you can start your editing immediately. Since the Production Tool works independently of the main application, you do not have to worry about the operating load while editing. The Production Tool allows you to monitor the specified folders at all times by checking them at the specified intervals and automatically adds the detected clips. These newly imported video files in your monitored folders will appear as stand-bys in the clip list of the Production Tool, ready for editing. Once files has been registered in the Production Tool, they will automatically be analyzed by the Commercial Candidates Detection function. After the detection completes, it shows where possible commercials may appear in the clip and are color-coded according to the confidence that is actually a commercial. Similarly, it allows you to create an index file for seeking which accelerates the seeking speed with automatic operation. * Protected or copyrighted/encrypted files cannot be added. Since editing from the Production Tool directly opens the clip editing window of TMPGEnc MPEG Smart Renderer 5, you can edit the clip immediately without wasting your time. Of course it is capable of sharing clips to TMPGEnc MPEG Smart Renderer 5 by drag/drop and copy/paste methods, and conversely, you can add clips to the Production Tool from the main TMPGEnc MPEG Smart Renderer 5 application. Besides the following functions, even more features have been implemented in TMPGEnc MPEG Smart Renderer 5. Try it for yourself! 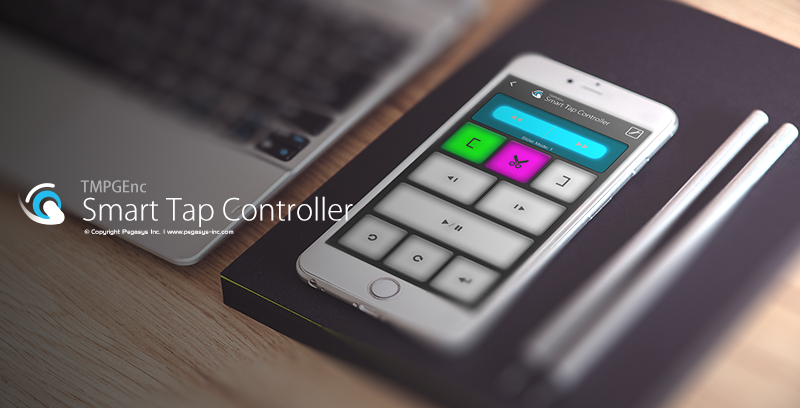 Supports "TMPGEnc Smart Tap Controller" which is an auxiliary controller that can control the cut-editing operations of TMPGEnc MPEG Smart Renderer 5 from your iPhone or iPad. In combination with a keyboard, a mouse or other peripherals, this controller allows more choices for user operation based on the user's preferences and makes editing smarter than ever. You can pre-register multiple projects in the Batch Tool, allowing you to output multiple projects at once. Some projects may require a lot of time to output because of complex HD video, or video that has many ranges to be re-encoded, or, perhaps your PC isn't that powerful. The Batch Tool lets you work on multiple projects, and then output them one after the other while you work on other things. Apply transition effects, including 3D transition effects, to add a three-dimensional effect between clips or scenes. There are over 170 transition effects to choose from, ensuring that you can add your own unique touch to your videos. TMPGEnc MPEG Smart Renderer 5 is only for Windows 64-bit OS versions, and cannot be used in a 32-bit environment. The following functions which are included in TMPGEnc MPEG Smart Renderer 4 cannot be used in TMPGEnc MPEG Smart Renderer 5. Please be aware of these changes before purchasing the TMPGEnc MPEG Smart Renderer 5 upgrade version. The Time Tone Reduction Filter in the Audio Denoise. * CPU's other than those listed above are acceptable provided they support the SSE3 instruction set and use a higher working frequency. ** This software may not function properly in environments where the memory is less than 2 GB and shared with an integrated graphic processor. In such cases, a warning may display at launch. This software cannot be used with computers having less than 1.5 GB of available memory (ex: memory shared with the video processor). In this case, increasing the amount of memory may fix such issues. Refer to your computer's documentation and/or contact your computer vendor for more information regarding memory extension. *** A FAT32 formatted hard disk drive (HDD) does not support a file size higher than 4 GB. Preferably, output your file to an NTFS partition. If you are using a FAT32 formatted HDD or external disk, it may be possible to convert it into NTFS format. Refer to your device's user manual or contact the device maker. Intel Media SDK Hardware Requires an environment with an Intel compatible CPU (SandyBridge core or newer) and a compatible driver. 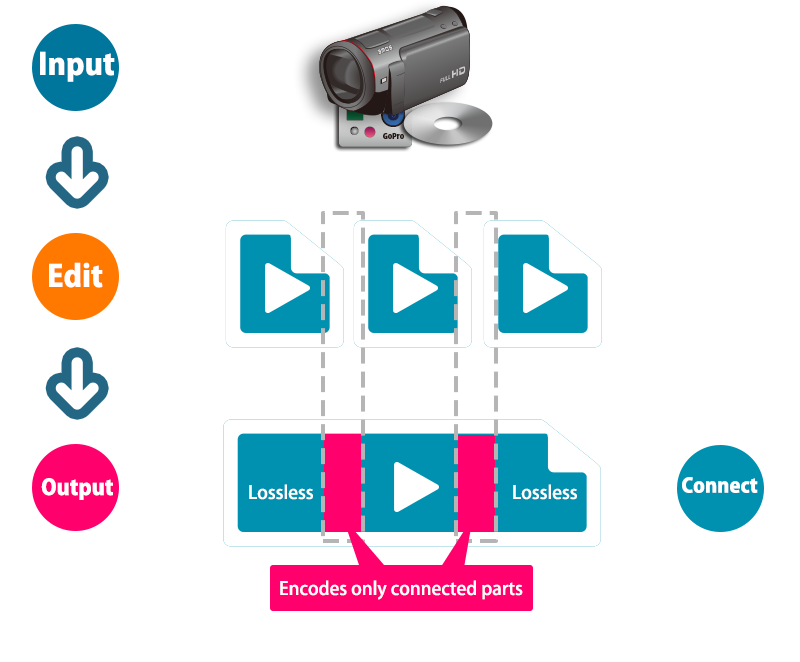 When using the H.265/HEVC video decoder in the Stream Format, an environment with an Intel compatible CPU (Haswell core or newer) and a compatible driver are required. NVIDIA CUDA Requires an environment with a 400-series and later GPU (Fermi core or later generations) and a compatible driver. When using the H.265/HEVC video decoder in the Stream Format, an environment with a GeForce GTX 950 (GM206 DAI) or later GPU and a compatible driver are required. Radeon Software Crimson Edition 15.11 or later.